A review of Rising from a Placid Lake: China’s Three Gorges at the Intersection of History, Aesthetics and Politics, by Corey Byrnes. For specialists and laypersons alike, the phrase “Chinese landscape” connotes highly stylized vistas laced with calligraphy, the jagged lines of vertiginous mountains and waters swept with brush and ink. Corey Byrnes in Rising from a Placid Lake detaches Chinese landscape from such immediate connotations to center his exploration on the ancient site of the Three Gorges and the concomitant dam project imagined by Sun Yat-sen in 1919, poeticized by Mao Zedong in the 1950s, and constructed by the PRC government beginning in 1994. Landscape, or Chinese landscape, in this exploration, refers to representations constituted by scroll painting and classical poetry only in part. Unpacking layers of representation, Byrnes’ study bridges the sites of ancient legend and imperial governance, of technological revolution and natural disaster with interpretations of classical literature, modernist painting, and cinema. Offering a material and visual pre-history of the Three Gorges dam project, Byrnes approaches landscape as a geological and macro-historical formation as well as a mediated object. Byrnes’ contribution to scholarship is a timely one, owing not just to the dam’s recent completion. By weaving traditional textual and temporal boundaries, Byrnes offers a refreshing foray into interdisciplinarity within the field of China studies. Divided roughly into two parts, the study first focuses on antiquity and classicism before entering the terrain of the present day. Throughout each chapter, Byrnes brings to light the ways in which the pre-modern inhabits the modern, as well as how structures of visuality — of spatiality, seeing, and what the author terms “emplacement” —reveal shared interpretive modes that link present with past. Chapter 1, “Tears in the Void: Traces of the Past in Du Fu’s Three Gorges Poetry,” lays the groundwork for exploring the textuality of the Gorges across millennia, with inscription serving as Byrnes’ primary conceptual thread to show how space is described, circumscribed, and prescribed (p. ii). To elaborate on the specificity of inscription in this context, Byrnes sets up discussion of the Tang poet Dufu 杜甫 (712-770) by invoking the notion of the trace or ji 跡. Byrnes conceptualizes the trace as a “play of presence and absence” (p. 42), a dialectic which structures the topographical features of a gorge (“by definition an absence, a negative space” (p. 99)) and serves as a platform for introducing the legacy of Yu the Great 大禹. As the legendary founder of the Xia Dynasty, attributed with the creation of the Three Gorges and the Yangzi River, Yu represents the mythological source of Chinese writing and wen 文or civilization (p. v). Drawing from the myth of Yu, Byrnes reads the connotations of ji literally (as Yu’s footprint), connotatively (“as an accidental inscription…a pre-linguistic text” (p. 5)), and ultimately as a meritorious act constituting the “physical traces of a civic deed” (p. 23). The cultural legacy that goes on, as of the eighth century, to build upon Yu, reinscribing his traces by seeing the landscape “through a textual lens” (p. vi), supplies the crux of Byrnes’ project. Du Fu eulogized Yu in several key poems, written 766-768, during the period of his life spent as a refugee and wanderer. These poems, as Byrnes writes, “eulogize the landmarks of the region” (p. 5), revealing the traces or ji that are “as likely to appear on the psyche as on the surface of the earth” (p. ii). It is such traces which reflect Du Fu’s own sense of displacement; perceived in his lifetime as a failure, Du was one of many scholars and statesmen kept from realizing political ambition. At the same time, Byrnes reads Du’s poetic traces in this landscape as creative stimuli and a medium for remembrance or nostalgia. Du Fu “generates a body of work that is both haunted by the inevitability of decay and death and also tightly woven into a textual and spatial tradition of exile and political failure”(p. 4). That is to say, Du Fu’s poems from this time reflect his own sense of displacement as much as they speak to the disintegration of centralized imperial power and the lyric tradition memorializing it. The poems in the tradition of exilic poetry that Byrnes interprets here — denggao 登高 verse, a poetic practice based on the act of beholding vistas, as well as the poems that comprise “Yearning for the Traces of Antiquity” (Yonghuan guji 詠懷古跡) — place Du Fu among centuries of writers and travelers who looked to discover and imaginatively rebuild the landscape on which they gazed. Byrnes calls attention to this chain of antiquity to account for a “model of textual influence in which texts are at least partially constitutive of perception,” so that we are left with “a meditation on how the textual experience of exile, combined with the topos of denggao, constitute poetic vision and perspective” (p. 16). Transitioning to the inscriptive practices that center on the legacy of Du Fu, Byrnes demonstrates how, ultimately, the landscape of Yu the Great transformed from the Tang to the Song into a highly personal space of memory, history, and exile. Chapter 2 continues Byrnes’ investigation of the ways in which the Gorges are in certain ways reconstructed by travel literature produced in the Southern Song (1127-1279). The collection of writings known as the Wuchuan lu 吳船錄 by poet and statesman Fan Chengda 范成大 (1126-1193) provide the chapter’s primary interpretive object. The shift indicated by the chapter’s title, “From Trace to Record,” speaks to Byrnes’ shifting focus from the ji 跡 of the trace to the ji 記 of the record, a shift which allows Byrnes to unpack layers of inscription encompassing Du Fu, the mythology of his landscape, and the literati practice assessing his legacy. The writerly endeavors of the Southern Song entailed a “personal pursuit of the past” (p. vii) that sought evidence, verification, and adjudication, all of “which functioned to reinscribe indelibly the historical or mythological trace ji 跡 as part of a record of action ji 記” (p. 54). The question of realism, of how to represent the real or whether it can be represented, accompanies Byrnes’ turn to modern forms of documentation, and reflects in part the legacy of socialist modernity informing Jia’s oeuvre. Jia’s works, for Byrnes, are “realist” insofar as they can be “seen as recording an unvarnished reality, an index of not only a disappearing material and social past but also the shortsighted actions that have led to their disappearance” (p. 71). The “promised connection to reality” that Still Life seems to offer within the art film subcategory of documentary-inflected cinematic realism is ultimately far more problematic in its execution. The different types of realism that Jia’s film encompasses —socialist, Bazinian, documentary — include also “Chinese aesthetic traditions that precede film and the realist paradigm” (p. 72) and that are moreover productive of an ethics of viewing. Jia neither embraces nor retreats from “realism” but rather seeks new means of representing and observing which “acknowledge the aesthetic, narrative and ethical demands on individual artistic projects” (pp. 77-78). Through his interpretations of key scenes and stills, which note Jia’s slow tracking, deep focus, “scrolling-style” and point-of-view shots, and introduce less familiar terms, such as multiplanar depth and scrolling breadth (pp. 94-95), Byrnes demonstrates how Jia’s film recomposes and juxtaposes political power and ideological landscape. The mode of viewing and “being in the world” that is generated by Jia’s hybrid representational and cinematic style proves revealing, for Byrnes, of a trans-historical dialogue (p. 79) through which Jia “cross[es] thousands of years and a multitude of forms to create a vision of a place so complexly inscribed and reinscribed that it cannot be captured with any single preexisting representational form” (pp. 94-95). Chapter 4 further examines the heterogeneity of representational form by addressing the ways in which contemporary artist Yun-fei Ji’s 季雲飛 Three Gorges paintings “imagine and image” this landscape as a “site of traumatic experience: both a raw fissure that opens onto past traumas, especially the Cultural Revolution, and a frame for the physical and psychic consequences of the dam project” (p. 98). Invoking the theoretical frames of trauma scholarship (Sigmund Freud, Shoshana Felman, David Eng), Byrnes explores the hidden logic linking the dam project with the Cultural Revolution and its legacy, careful to note that his goal “is not to read Ji ‘through the lens’ of trauma, but to explore how his personal conception of trauma shapes his work” (p. 98). In this respect Byrnes once again brings into relief the comingling of the personal and the national, the individual and the collective, which characterize inscriptive practices of Chinese landscape, allowing his reader to perceive “how conceptions of the national, regional and global coalesce in the individual’s experience and representation of trauma” (p. 98). Time and temporality remain at the core of Byrnes’ discussion of the Gorges as the site of traumatic experience in the present day, specifically the temporality or “collapsed time” of demolition, rapid development and, by extension, the temporality of transformation. For Byrnes the history of personal experience is no less significant than the history of Chinese geopolitics, including but not limited to the multi-mediated revolutions inscribing the landscape of the twentieth and twenty-first centuries. Owing to its interdisciplinarity this study of the Three Gorges makes it difficult to classify. Yet by drawing from a host of existing scholarship in literary, art historical, and cinema studies, not counting the complex array of theoretical frameworks that accompany each, Byrnes opens wide the exciting potential of modern area studies. His project is exemplary of the kind of work that can be realized at the intersections of disciplines across the humanities, across media—and, perhaps most crucially for this project, across time and discreet yet contemporaneous temporalities. University of California, Berkeley. 2013. 181 pp. Primary Advisor: Paula Varsano. 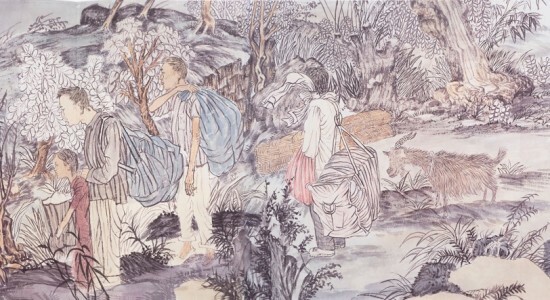 Image: Yun-Fei Ji, Four People Leaving Badong, 2009. Watercolor and ink on Xuan paper mounted on silk, 22 1/16 x 66 2/8 in., 56 x 186.3 cm. © Yun-Fei Ji. Courtesy James Cohan, New York.